Here is another monthly piano club arrangement that can also be purchased here at the Koerts Music store. I have purchased several bundles and joined the club. 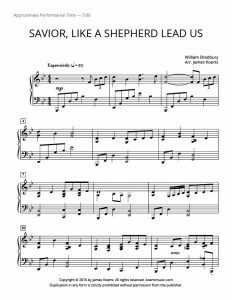 I have really enjoyed “Savior Like A Shepherd Lead Us” and the arrangement of “How Great Thou Art” recently sent to club members. I am very pleased with the Club and look forward to the monthly selection. I enjoy the little more advanced selections. Thank you for sharing your talent with us. Awesome, Billie! So glad you are enjoying the piano club. Best wishes for you and your ministry.